Cabana style Guest Apartment on The Kaloli Point Peninsula, located just 1.5 blocks from the ocean. Listen to the ocean sing you to sleep, even thr whales may join in, during the “winter” months. 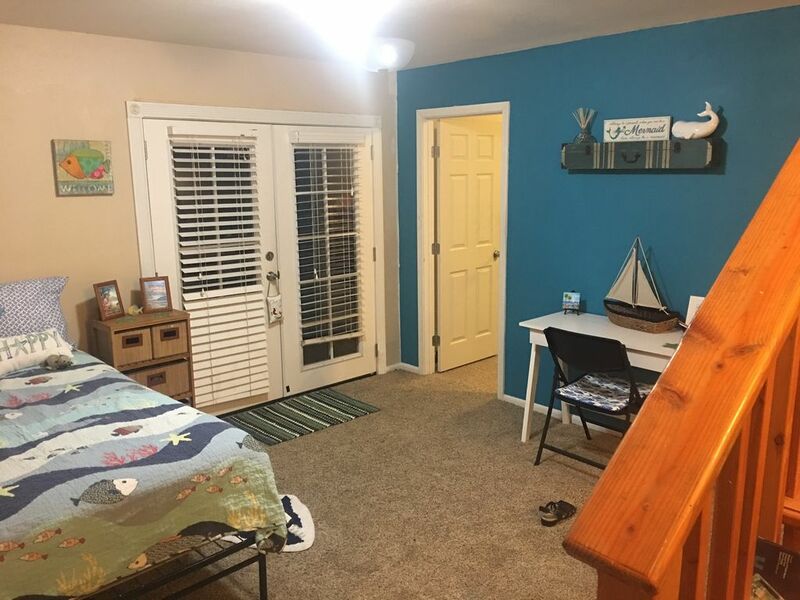 Studio plus one bedroom makes a 980 square foot space of your own, with a laundry room, surf and boogie boards, a fat tired beach cruiser bike, and lots of beach toys. Spacious, in a very quiet neighborhood. We live on the cliff, but you can hike down to a secluded beach. We love to show our guests the Island when we are free, or we can guide you to thr hidden gems on the tropical side of the island. I followed my dream and moved to Hawaii from Wisconsin two years ago. I came here like each of you looking for a unique home to rent. Now, I have bought the home that dreamed of, and set up housekeeping! Come and join us for your vacation and we will share why we love this Peninsula and tropical side of Hawaii. My house is big, it is meant to share. We turned the first floor into a self contained apartment so travelers can have their privacy, yet so much space, almost 900 square feet of space, I chose this house for the stereo effect of the ocean on all three sides, throw in the whale songs in the winter and you have a symphony! I love to babysit, so if you have kids and need a night out, my daughters and I are right here to help out! Our home also comes with fun beach and ocean toys including a surf board, boogie boards, and a beach cruising bike. We live on a gravel road, it is a great place to explore by foot or bike and we have a hiking path down to a hidden beach! We might be willing to babysit depending on our schedules. We might loan out one of our dogs for walks, hikes, and shared adventures! We loved having Kari and her family here! I enjoyed seeing the kids playing with the games and toys together. You really made it your home away from home. It was fun to hear about your adventures on the Island and to meet your multi-generational family. I am glad that you enjoyed being close to the ocean too. That is also my favorite thing about this house! I hope that we see you guys again, thanks for being such great guests! My family enjoyed our stay at “The Ocean’s Song” after a long day of sightseeing. Cynthia was a fantastic host and location was ideal. Kids enjoyed the games and wished we had stayed longer when it was time to pack up. Very close access to beautiful rock cliff view of ocean. Excellent place, warm and cozy, quiet and secluded, fantastic host. Cindy (the owner) is so helpful! She responds quickly to questions. She is gracious and very knowledgeable. She even took time from her schedule to give us an interesting and unique tour of the the area, including taking us to where the 2018 lava flow destroyed many of the homes and created a new black sand beach (see Isaac Hale Beach Park and Pohoiki Black Sand Beach). We felt like she gave us a realistic insider's perspective to the area. Cindy's home is relaxed and comfortable, secluded and quiet. It had everything we needed for our short stay. We wish we could have stayed longer in this home close to the ocean. We jogged while there and felt safe doing so. Her home worked fine for our family of 4 with 2 older kids. Since it is rather secluded, you will need a rental car to get around. I am so pleased that you enjoyed your rental and stay with us! I especially enjoyed the morning that we toured together lower Puna, the new lava flow and black sand beach, the pleasure was all mine. I enjoyed sharing with your family what really happened in our community as we responded to the volcanic eruption. I smile when I think of the nice time that we shared. Thanks for being such great guests! We loved our stay. The decor had all the extra thoughtful touches. Our daughter loved all the toys, games and books. We appreciated the beach toys and towels to use. We were very comfortable. Thank you for being such a great guest Monica! I am glad that you enjoyed our home and that your daughter enjoyed the toys. Thank you for sending such a beautiful photo of her enjoying the rainbow and our front yard! I hope that you will return when we are on Island and our girls can play together! Aloha!